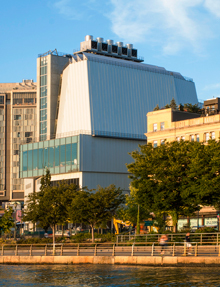 Journey to the new Renzo Piano designed Whitney Museum of American Art in New York City. Visitors will be able to explore the museum at their leisure as well as the surrounding city. The Whitney Museum is a premier destination for viewing Modern and Contemporary American Art. View the featured exhibition, “Archibald Motley: Jazz Age Modernist” or any of the permanent collection. Along with access to the incredible Whitney Museum and its two on site restaurants, this trip will allow travelers to explore the bustling meatpacking district which is the home to many galleries, the High Line, hip eateries and shops. The bus will board promptly at 5pm. Deadline for advance reservations extended to September 25. Limited seating available. Contact Dawn Salerno at 860-536-7601 x209. Bus departs from and returns to the parking lot of Mystic Museum of Art.